It’s the nightmare scenario every multiengine pilot is taught to avoid. The critical engine has lost power, and the propeller windmills uselessly in the breeze. The good engine is pounding out full power, creating maximum asymmetric thrust. And the nose is held high above the horizon as airspeed rapidly decays. This is the prelude to a loss of control in most twins—but Velocity Aircraft’s new V-Twin is designed to be different. “Keep pulling the stick all the way back and hold it there,” says Velocity Aircraft Chief Pilot John Abraham, knowing that the advice he’s giving goes against everything pilots are taught in multiengine training. As the V-Twin slows below blue line, the wing on the side of the dead engine gets noticeably heavier, but opposite aileron and rudder keep the airplane from turning in that direction. Finally we reach stall speed. Most conventional twins would perform an involuntary roll toward the dead engine at this point, but not the V-Twin. As I hold full aft stick, the canard stalls; the nose drops about 15 degrees below the horizon; airspeed increases; the nose slides toward the dead engine, then rises above the horizon again, and the canard stalls a second time. The cycle repeats itself several times before I pull both throttles back to idle and continue holding full aft stick. Now, the V-Twin’s nose nods and bobs like a bored college student at an after-lunch chemistry lecture as the airplane flies straight ahead in a long, sine-wave descent. The lazy, up-down oscillations make the V-Twin feel like a rocking chair. Since the canard’s angle of incidence is 3.5 degrees greater than that of the swept wings (and share the same airfoil), the canard stalls before the wings reach their critical angle of attack. Despite the canard’s repeated stalls, airflow over the wings remains smooth and uninterrupted. Also, the V-Twin’s engines and (normally rotating) pusher props are mounted close together so the thrust lines aren’t as far apart as a conventional twin’s. The design feature reduces asymmetric thrust and helps lower the minimum controllable airspeed well below the airplane’s stall speed. As soon as I relax back pressure on the stick to lower the angle of attack, the V-Twin resumes normal flight. With the addition of cruise power, the airplane’s stable, well-balanced control characteristics return. Velocity Aircraft was founded in 1985 and built a popular line of four-seat, single-engine kit airplanes modeled after the Burt Rutan-designed two-seat Long-EZ. Duane Swing designed and built a retractable landing gear system for the Velocity, and in 1992, he and son, Scott, bought the company. The genesis of the V-Twin took place more than 10 years ago when Duane produced a wooden model of a twin-engine design and brought it to the Sun ’n Fun Fly-In in 2002. More than 100 people expressed interest in the airplane that resembled a piston version of the Beech Starship, and signed up for a newsletter to stay abreast of developments. But Swing waited until late 2011 to actually produce the V-Twin, and he went ahead for one overarching reason: His wife Bonnie was extremely reluctant to fly in any single-engine airplane. 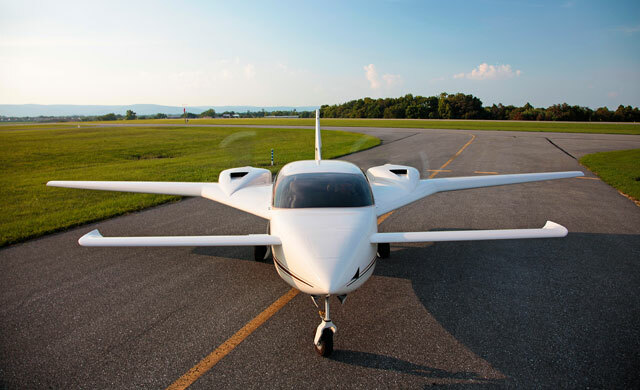 The prototype, N91VT, flew for the first time in March 2012, a few days before the Sun ’n Fun Fly-In where it made its first public appearance. Unlike other high-profile new product introductions, the V-Twin just appeared without any drumroll or PR fanfare. In a quest for low operating and maintenance costs, Swing chose 160-horsepower Lycoming IO-320 engines for the V-Twin. He selected a full-feathering, wood-core MT propellers for their light weight, and the fact that the 3-blade design provides sufficient ground clearance. The V-Twin is identical in most aspects to the top-selling singel engine Velocity XL. The fuselage, wings, and landing gear are all identical. But the V-Twin has a single tail and conventional rudders instead of wingtip strakes (that operate independently) for yaw control, slightly larger fuel tanks (100 gallons instead of 90), and center-mounted engine and prop controls and side sticks. The V-Twin weighs about 2,000 pounds empty and gross weight is set at 3,200 pounds. The fuel system is comprised of two wing tanks that gravity feed a single header tank, and the header tank supplies fuel to both engines. The two main tanks are plumbed together so that fuel levels remain balanced automatically in flight. 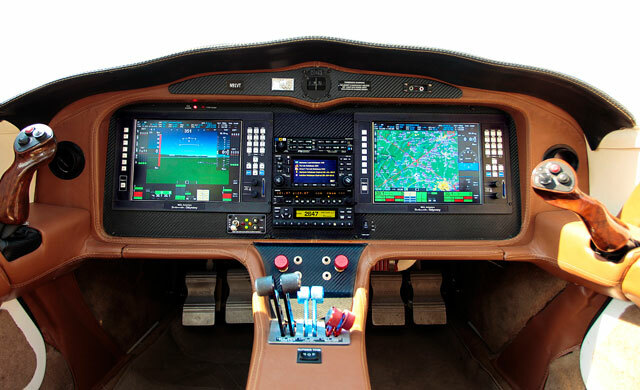 The prototype’s panel is comprised of a two-box PFD/MFD suite by MGL Avionics, although customers can set up their panels in a seemingly endless variety of configurations and use the avionics manufacturer of their choice. The side-stick controllers, center-mounted throttle quadrant, and conventional rudder pedals give the cockpit a clean, comfortable, thoroughly modern feel. The retractable landing gear is electro-hydraulic with a speed sensor (instead of a squat switch) that allows it to be operated above 70 KIAS. Double-puck Cleveland brakes provide the stopping power. Two top-hinged gull-wing doors provide easy access to the spacious V-Twin cockpit. Seats are right about hip height, so getting into the sliding front seats is as easy as sliding into a car. Engine start is standard for fuel-injected Lycomings, and the only part that seems slightly odd is the inability of the pilot to see the right-engine propeller. The MGL Avionics suite provides digital readouts for engine performance, and the pilot synchs the props using the electronic rpm information. Visibility on the ground and in flight is very good with wrap-around glass. The only blind spot for the pilot is at the door intersections at about the 10- and two-o’clock positions. Taxiing is done with differential throttle and braking, and the nosewheel is free castering with a shimmy damper. We’re carrying two FAA-standard sized adults in the front seats and about 65 gallons of fuel on this demo/photo flight on an 85-degree Fahrenheit day near sea level. Engine run-up is standard, and we’re soon cleared for takeoff. I hold the brakes and power up the engines well into the governing range. Initial acceleration is brisk, and the rudder is almost instantly effective. After a ground roll of about 1,800 feet, I rotate at 80 KIAS and the nosewheel comes off the pavement obediently, followed about two seconds later by the mains. There’s no extra drag during landing gear retraction, so the airplane accelerates smoothly during the approximately five seconds it takes for the gear to tuck up. I pitch for 104 KIAS (blue line) and the VSI indicates a climb rate of 2,500 fpm. Once clear of the airport traffic pattern, I settle into a cruise climb behind the Bonanza A36 photo ship at 120 KIAS climbing at 1,000 fpm. Abraham says the normally aspirated engines give the best cruise performance between 8,000 and 12,000 feet. At 10,000 feet, full throttles, and 20 inches of manifold pressure at 2,500 rpm typically yield 170 KTAS and a total fuel burn of 12 gph. On the 800-nm flight from the Velocity factory in Sebastian, Florida, to AOPA headquarters in Frederick, Maryland, the V-Twin flew at 11,000 feet and covered the distance in four hours, 20 minutes while consuming less than 50 gallons of fuel. Abraham said he’s flown the airplane more than 1,100 miles nonstop and landed with 2.5 hours of fuel in reserve. The V-Twin doesn’t have flaps or speed brakes, but flattening out the prop pitch allows the airplane to make steep approaches without gaining excessive speed. Abraham sets up a high approach to Frederick Municipal Airport’s Runway 23. On a two-mile final at 2,500 feet agl, he slows to 100 KIAS, lowers the landing gear (two green lights mean the nose and main landing gear are down) and allows the V-Twin to descend at 2,000 fpm. Once he intercepts the normal glideslope, he adds power to arrest the rapid rate of descent and flies the last half mile at 90 KIAS. Unlike conventional airplanes in which the tail is in the propeller’s slipstream, the V-Twin’s canard gets no assist from prop blast. The mains roll on, and Abraham wipes off the remaining power as he brings the nose wheel to the ground. Moderate braking brings the V-Twin to a stop after a ground roll of about 1,800 feet. At a time when the market for piston twins seems all but dead, it’s surprising to see a new airplane that brings such promise to the moribund category. But the V-Twin is difficult to categorize because it so convincingly and directly confronts the reasons for the piston twins’ demise. It won’t stall and spin; it can climb on one engine at full gross weight; it has a single-engine service ceiling that’s taller than all but the highest mountains in the continental United States; Its speed and cost per mile are exceptional; and with proven engines and props, and by being part of the Experimental category, its maintenance costs should be far lower than a Standard-category twin—and its insurance costs should be lower, too. Still, the V-Twin isn’t inexpensive. The kit alone costs $110,000, and that doesn’t include engines, props, or instruments. And then there’s the matter of actually building it—a prospect that relatively few of the people capable of buying and flying the airplane are likely to relish. Swing says that for these and other reasons he’s considering seeking certification for the V-Twin—and investors have queried him about getting certification overseas and then applying for FAA approval through reciprocal agreements. But for now, Swing says he’s content to have built what he considers to be an extremely safe, economical twin that far outperforms the Twin Comanches he used to own—and one that his wife will happily travel in.